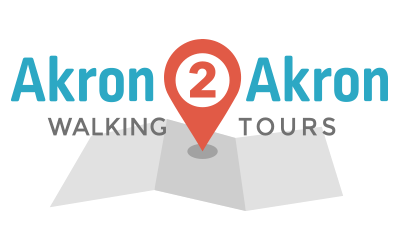 Akron2Akron Neighborhood Walking Tours: Create a Walk is LIVE! Akron2Akron started off as a very simple idea in the winter of 2014 by a group of Akronites. Our goal was to recruit people who are passionate about where they live and ask that they show us around their neighborhood by taking a walking tour. We invited the public to join us to become tourists in their own hometown. We learned about history, discovered new things, celebrated the great assets, and had meaningful discussions about ways to improve neighborhoods and better utilize space. Since then, we've met hundreds of incredible people and receive requests on a regular basis from passionate people to lead tours of their neighborhoods. In fact, we received such positive feedback from the community we were backed up with requests for walking tours. This is a GREAT problem to have. Realistically, our team could only manage one tour a month (this isn't our full-time gig, we just really love Akron). But we didn't allow our limitations to stop us from dreaming big. What if we could have several tours a month, or better yet, every weekend?! Thankfully,with generous funding from the Summit County Public Health, we're one step closer to achieving that vision of encouraging residents to lead neighborhood walks throughout the year. Akron2Akron has always been a citizen-led initiative, but now, anyone can submit an idea to lead a walk with our Create a Walk feature. You don't have to wait for our calendar to open up. It's simple, easy and exciting. We'll review your idea and if approved, will help rally our troops to get as many Akronites out to your walk as possible. We do this through heavy social media support, a feature on our website, and a listing in our upcoming tour page as an independently organized walk. That just means it's not part of Akron2Akron regularly scheduled monthly walks. Don't want to lead a walk but have an idea for a tour? You can also suggest a walk to us too! Before we sign off, we want to recognize Leadership Akron for being our fiscal sponsor for this project and Coffee and Code for helping us revamp our website and develop the much needed Create a Walk component to our initiative. We're lucky to have them as partners. Lastly, a blimp-sized thank you to those individuals who continue to join us on walks month after month. Now enough talk and let's get to walking!